Reliance Jio might be the 4G fastest network in India, according to TRAI’s MySpeed app and data, but a new report by OpenSignal has indicated that Airtel is leading 4G LTE speeds in India. OpenSignal’s ‘State of Networks’ report for April 2017, points out while Jio has the highest availability of 4G networks in the country, when it comes to speed, Airtel is the clear leader. 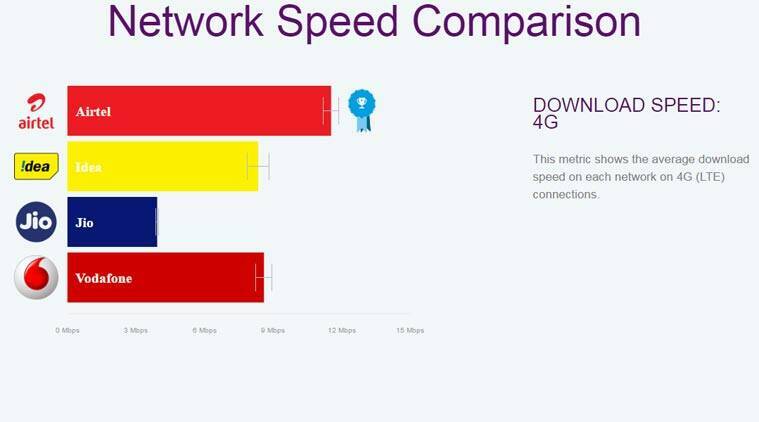 According to OpenSignal, Airtel won their 4G speed award, but also came on top of the 3G speeds, and as well as overall rankings across networks. It should be noted that Reliance Jio is a 4G VoLTE only network with no 3G or 2G internet. Airtel clocked in average LTE download speed of 11.5 Mbps, and according to OpenSignal, this was “3 Mbps faster” than the results they got on nearest rivals Vodafone and Idea. If you look at OpenSignal’s chart, Reliance Jio comes in fourth in the list with LTE download speeds of 3.92mbps, well below Vodafone’s 8.59mbps and Idea’s 8.34mbps. If you compare this to TRAI data, OpenSignal is reporting a vastly different picture. According to TRAI’s MySpeed app, Reliance Jio’s average download speed was at 16.48 mbps in March, which was much more compared to 8.33 mbps on Idea Cellular and 7.66 mbps on Bharti Airtel. However, OpenSignal’s report also says that India’s operators are still well below the global average for 4G download speeds. While Jio might not have topped the speed charts in OpenSignal’s tests, it does note that when it comes to network availability, the newcomer is well ahead of its rivals. 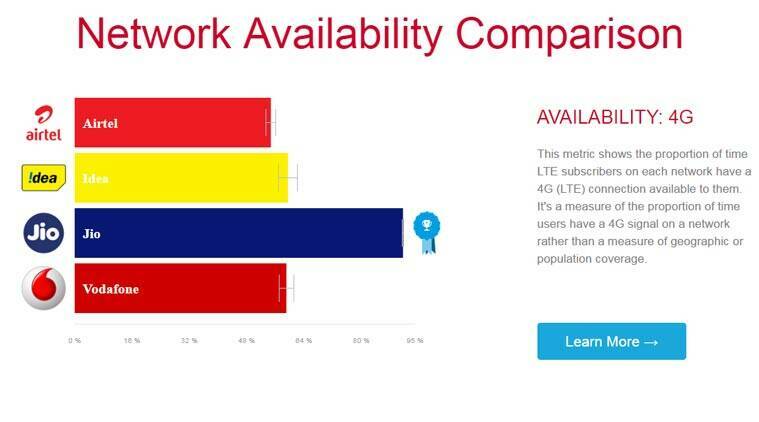 The report shows “testers on Jio’s network were able to find a 4G signal 91.6% of the time,” which is “an exceptional availability measurement by any global standard.” Other operators did not score higher than 60 per cent in the availability test, according to OpenSignal. OpenSignal also says in the four economically important regions of India, the competition is between Airtel, Vodafone and Jio. 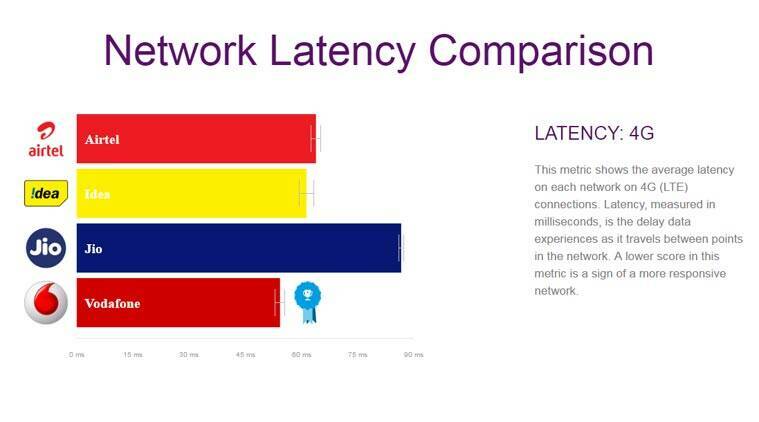 Also when it comes to network latency, which indicates a network delay in data transfer, Jio fares the worst, with Vodafone showing the best performance. So how does OpenSignal do the testing for the speeds? The app takes a “background reading from the device multiple times per minute,” and it calculates averages per device. OpenSignal looks at all data at the device level, and only take LTE into account when it has verified that the device has connected to LTE successfully at least once. Reliance Jio and Airtel have been warring over speeds for sometime. Airtel was forced to withdraw its ‘Fastest network’ claim after Jio’s complaint was held valid by the Advertising Standards Council of India (ASCI). Airtel was deemed fastest network by Ookla, which has a popular speed test app, but ASCI said the claim could not be considered valid. The leading telecom player was then asked to withdraw ads with the Ookla claim.